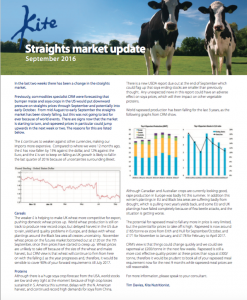 In the last two weeks there has been a change in the straights market. Previously, commodities specialist CRM were forecasting that bumper maize and soya crops in the US would put downward pressure on straights prices through September and potentially into early October. From mid August to early September the straights market has been slowly falling, but this was not going to last for ever because of world events. There are signs now that the market is starting to turn, and rapeseed prices in particular could jump upwards in the next week or two.